On the north side of the house, we still have about two feet of snow piled up beside our driveway. At the mall this weekend, there were piles of snow six feet tall and more where the snow plows had dumped them. But it is 39 degrees out, positively balmy for us, and I can hear the birds' lively chirping and singing. Spring is in the air. We cannot depend on consistently warm days for another four to six weeks yet, and even then it's touch and go, but we Michiganders take what we can get. The young man helping me with my groceries last week was outside in his shirtsleeves. When we get into the 40s, some of our hardier natives will even don shorts. I bought a bouquet of tulips to celebrate. The teapot is from Fitz and Floyd, bought years ago. I am using a violet teacup and a yellow one with it, and a violet sugar and creamer set. None of it "goes" together, as in a set, but the colors seem pretty and spring-like. The sugar and creamer came from my mother-in-law. The pattern is "Devon Violets" by Sutherland. These plates belonged to my husband's grandmother. I've always loved their soft greens. 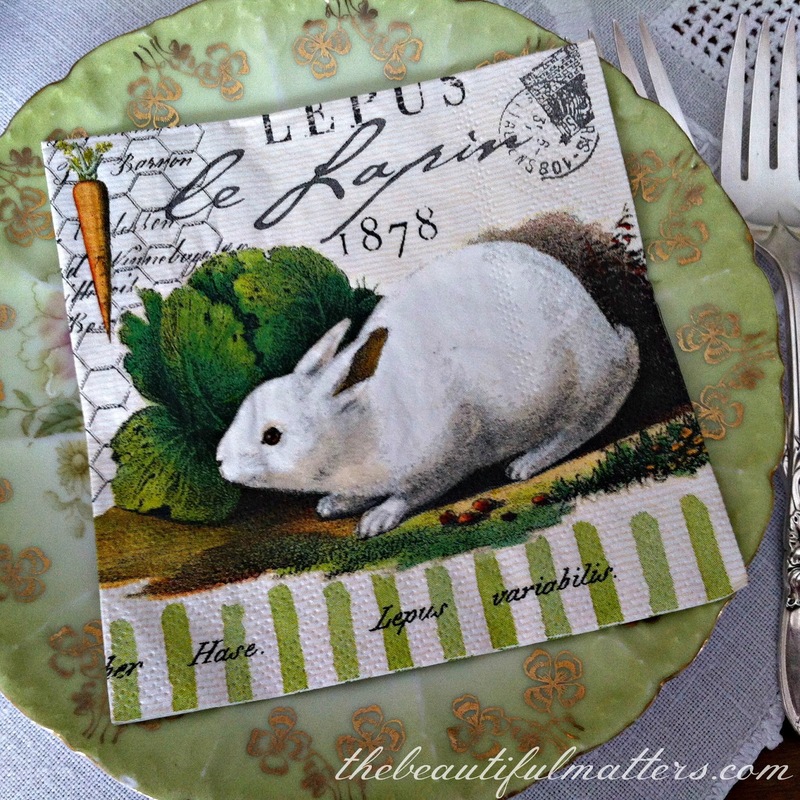 And one of my very favorite animals on the napkins, le lapin. The white chocolate raspberry truffle cheesecake is left over from a birthday celebration this weekend. So fabulous. I don't care for really heavy cheesecakes; this was light and creamy, perfect. This tea cup is Royal Windsor. I will be drinking Victorian Earl Grey Black tea. From the turf like the voice and the instrument. If you haven't been over to check out my *** GIVEAWAY *** , it's here. I will be drawing a winner on March 17. Your spring teascape is wonderful ... great colors and tulips. 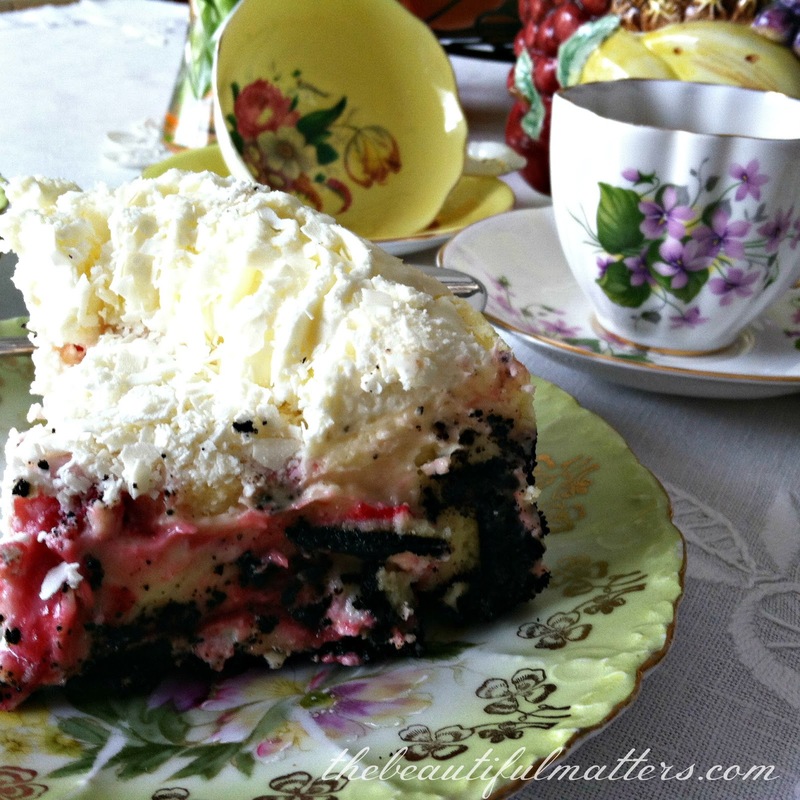 White chocolate raspberry truffle cheesecake -- just the idea adds pounds! It looks so good. Happy Spring and Happy Tea Day! Wow, it's so beautiful. And such a whimsical collection! I like the words underneath your header. That teapot really is a statement piece! What a wonderful tea post, Deborah. I love your teapot. It's quite unique! The violets are all so sweet and the pink tulips; my favourite colour! Well, one of my fav colours; I like white tulips too. Your teacup is lovely and I love its shape. Cheesecake looks good too. I've enjoyed your post very much and thank you for sharing it with us. Thanks for joining me for tea and have a beautiful day. I LOVE the fruit teapot! How fun is that! And the violets are so pretty. 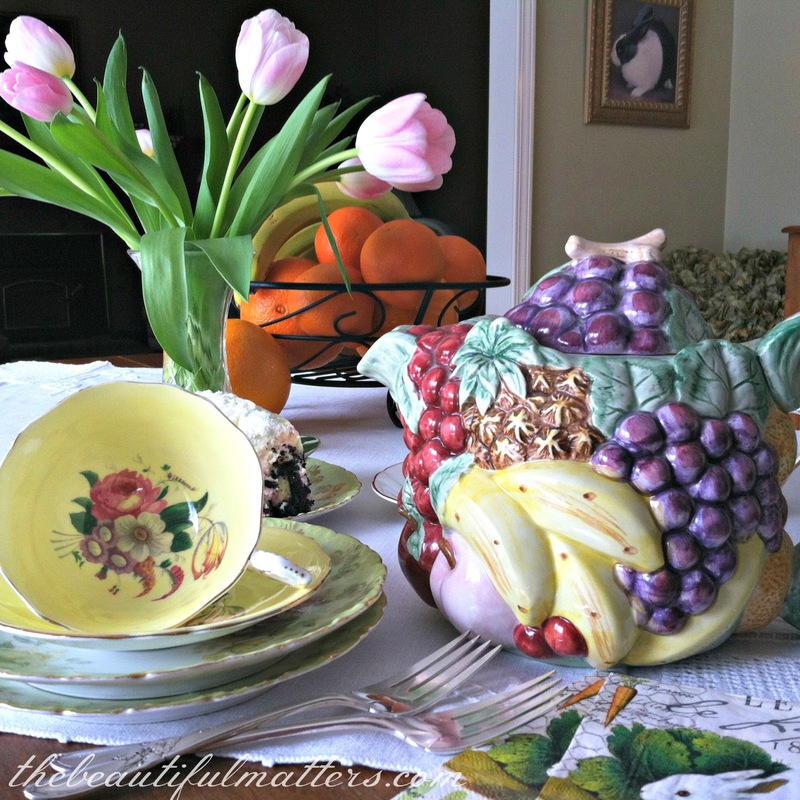 A wonderful spring tea setting. That should warm you up nicely! What a lovely Spring tea you've set today. I love the Fitzpatrick's and Floyd teapot and all your teacups. Happy Birthday to you!! The cheesecake sounds and looks wonderful. I do enjoy your pretty tulips, too. Goodness, I just saw that spell check changed my Fitz to Fitzpatrick!! LOL!!! Everything is so festive and cheerful... better be careful that bunny looks mighty interested in the fruit on that gorgeous teapot.... I am much more interested in sticking my finger in that cheesecake when youre not looking! 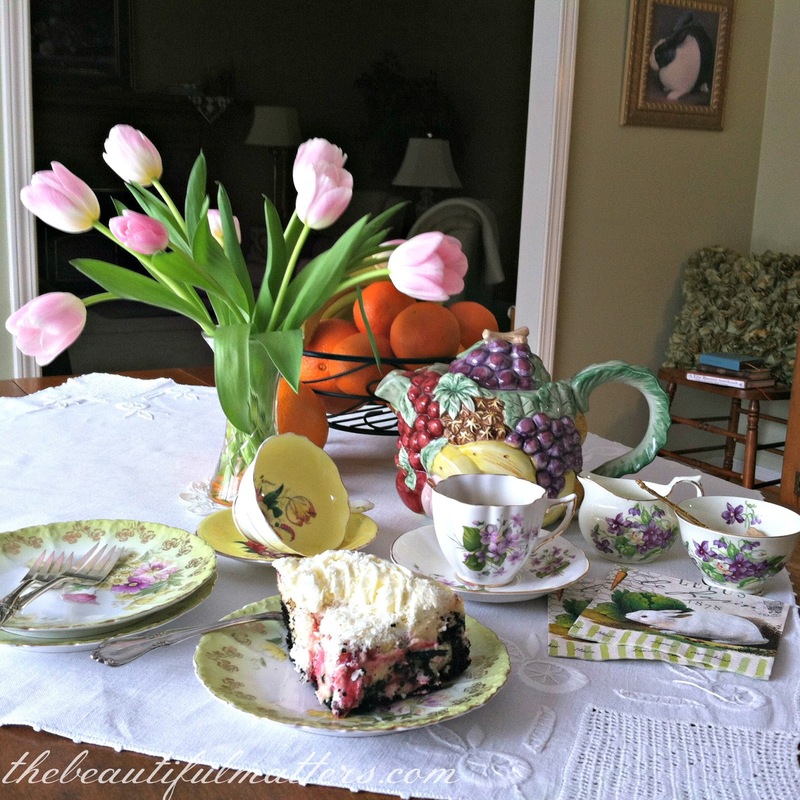 We have about the same amount of snow here, so your pretty spring tablescape with the whimsical teapot is a sight for sore eyes. The cheesecake looks yummy and I enjoyed the poem. Love the green plates that belonged to your grandmother! And all the other beautiful things you are including in your tea today. You have a beautiful collection of china. 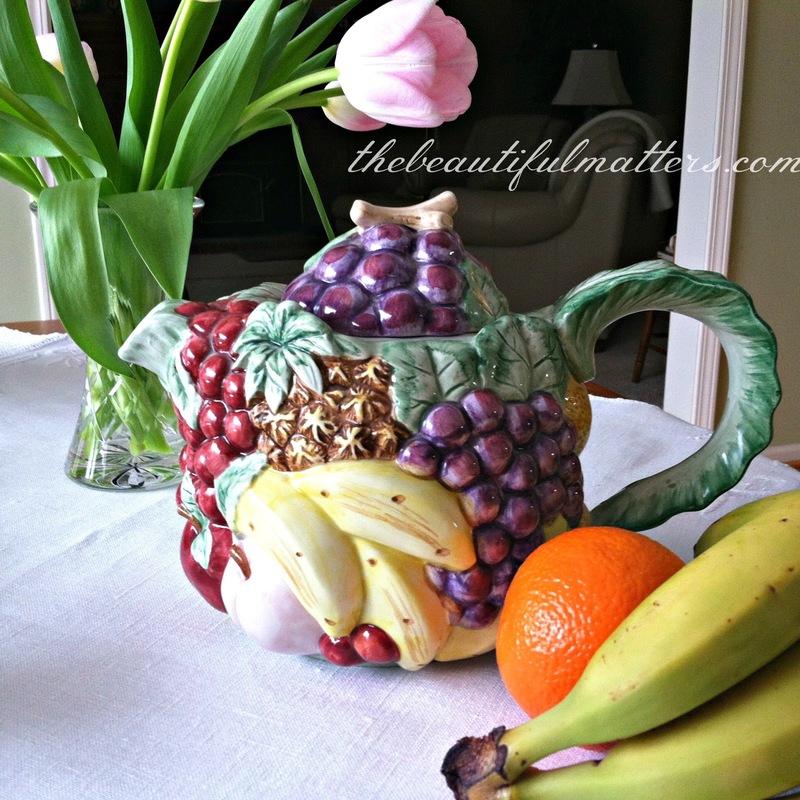 The FnF fruit teapot is very colorful. I live in the Dallas area and this is where the company head quarters were so I have gone to many, many of their sales over the years. We had so much fun and the prices were wonderful and they always opened for each different holiday. 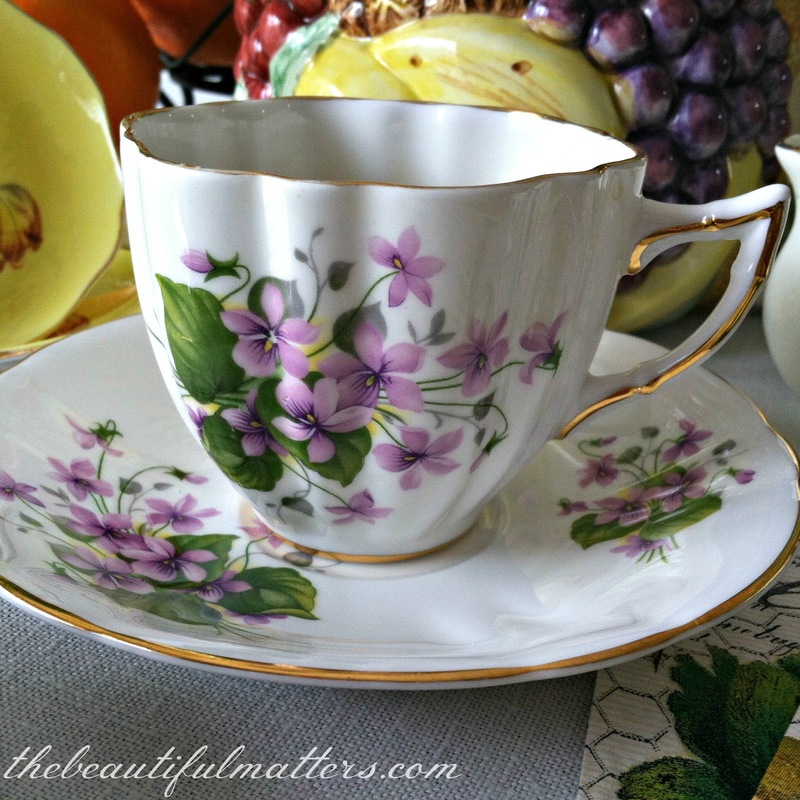 Your lavender flowered cup and saucer plus creamer and sugar is fabulous. Hope your days are warmer for our weather is 80 this afternoon. Have a delightful week! Oh! That cheesecake looks divine. And it reminds me of how LONG it has been since I've had cheesecake. Such sweet and charming ambiance in your early spring teascape! Although I do appreciate a set of something, I tend to go for the mismatched but coordinating pieces when styling my home, and that includes tablescapes. Having said that, your sweet treat perfectly complements your colour scheme; how appetizing is that?!! Hello! What a gorgeous blog you have here! 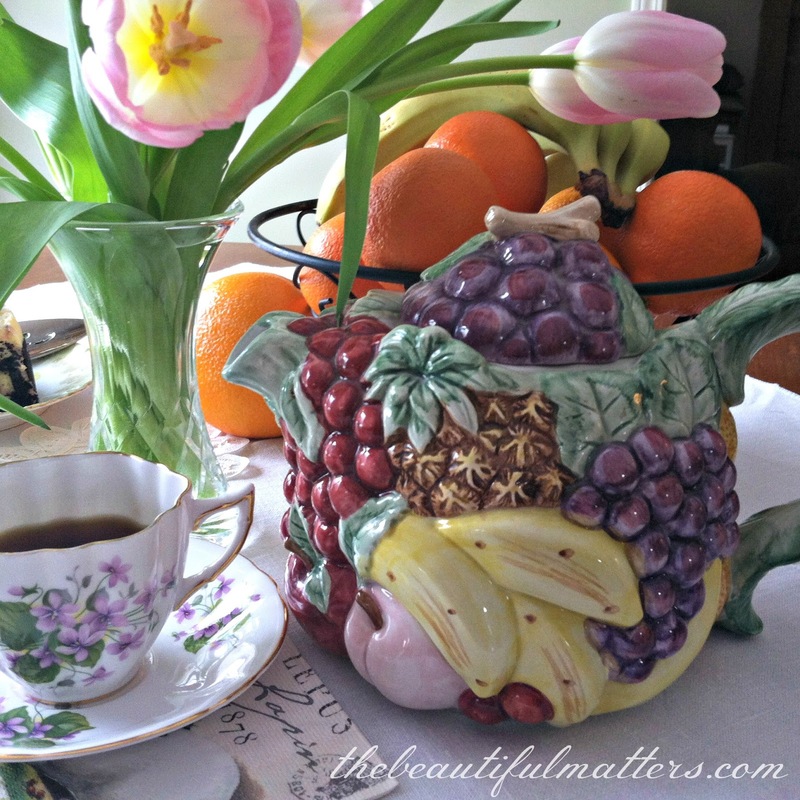 I just love your lovely tea photos and all the wonderful treasures you have with them! Shoveling my way out here this morning -- another 8-10 inches today! Maybe spring will arrive to this fair state soon? Either way - thank you for your kind comments...I am adding you to follow! What a lovely posting and frankly I am mix and match all the time so this is lovely. The plates you have from your hubby's grandmothers are really beautiful and especially also that yellow cup and saucer with the pretty "inside". The table setting itself is a delight! So glad you shared at Friends Sharing Tea! First, thanks for becoming my newest follower. 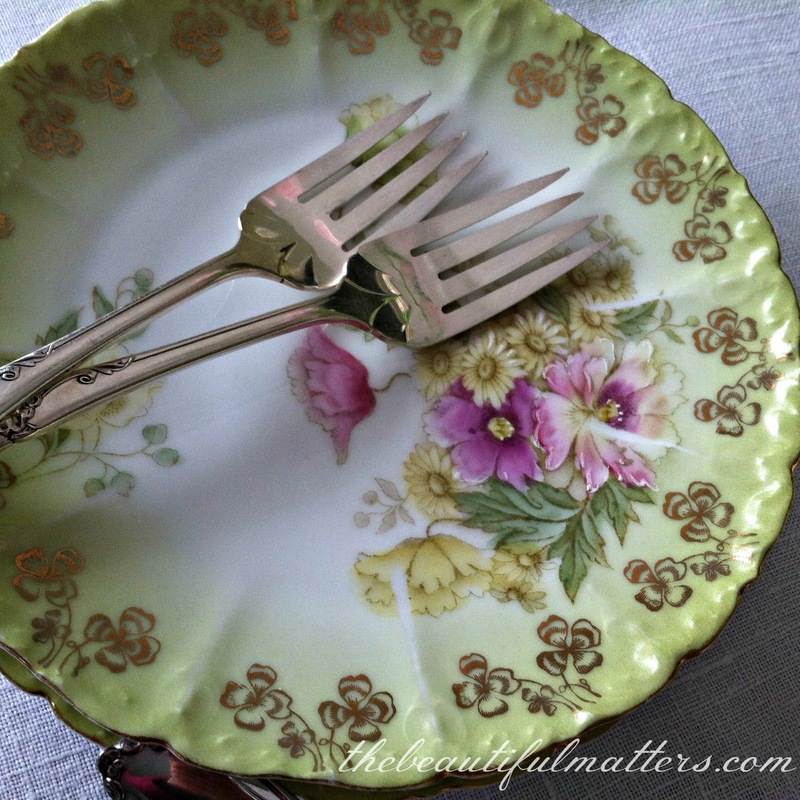 Yellow is my favorite color and that yellow teacup is definitely swoon worthy. Love the soft green of the plates too. 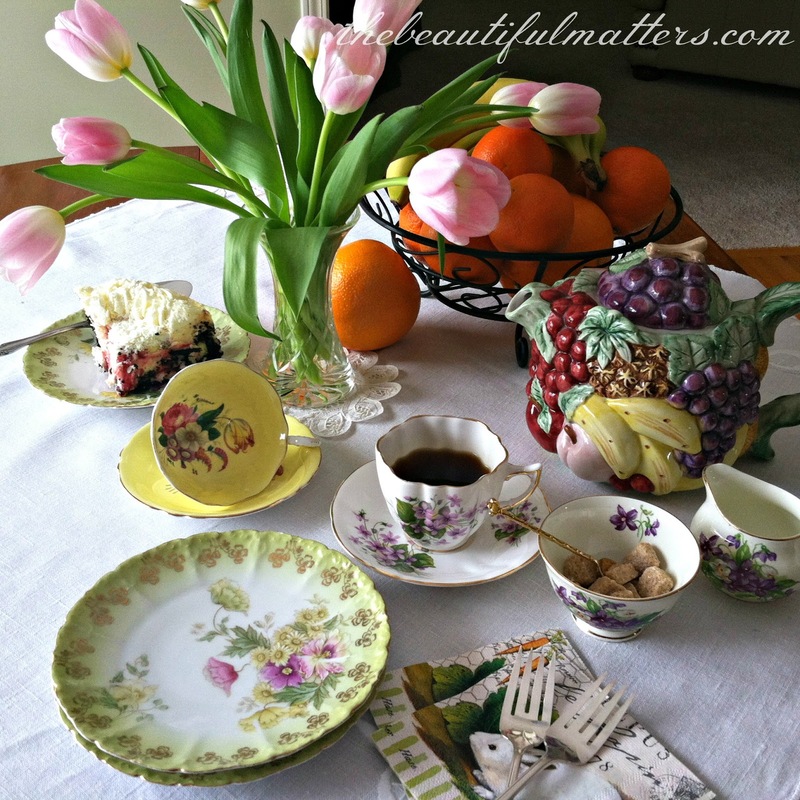 Your table is very eclectic just like spring with its different colors and blooms so it is a perfect spring tea! I love your husband's grandmother's plates, they are beautiful. Thank you for visiting me at my blog. 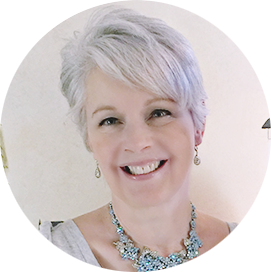 I can't even tell that you are a new blogger--your blog is so nicely done! And you take wonderful pictures. I'm definitely still on a learning curve. 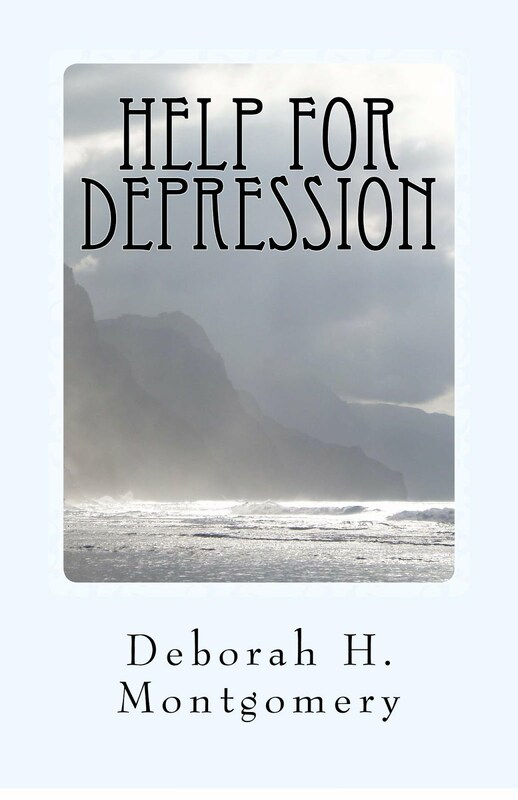 Sorry for the deletion, I hit publish too soon...as I said, learning curve :) . What a beautiful Spring tea! 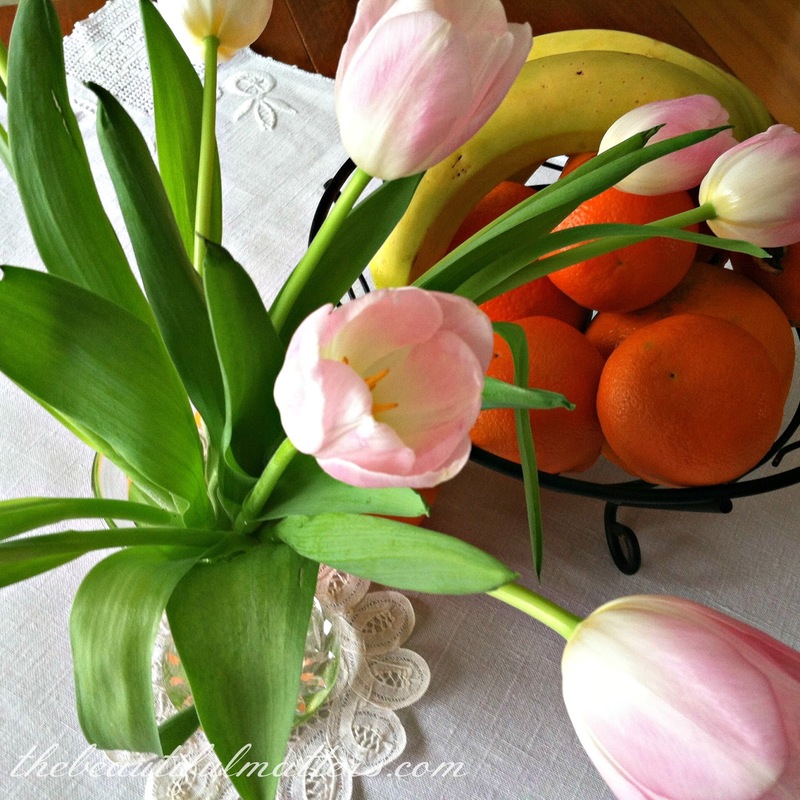 The colors are perfect and the pink tulips help Spring seem close by! Your spring table is just stunning! 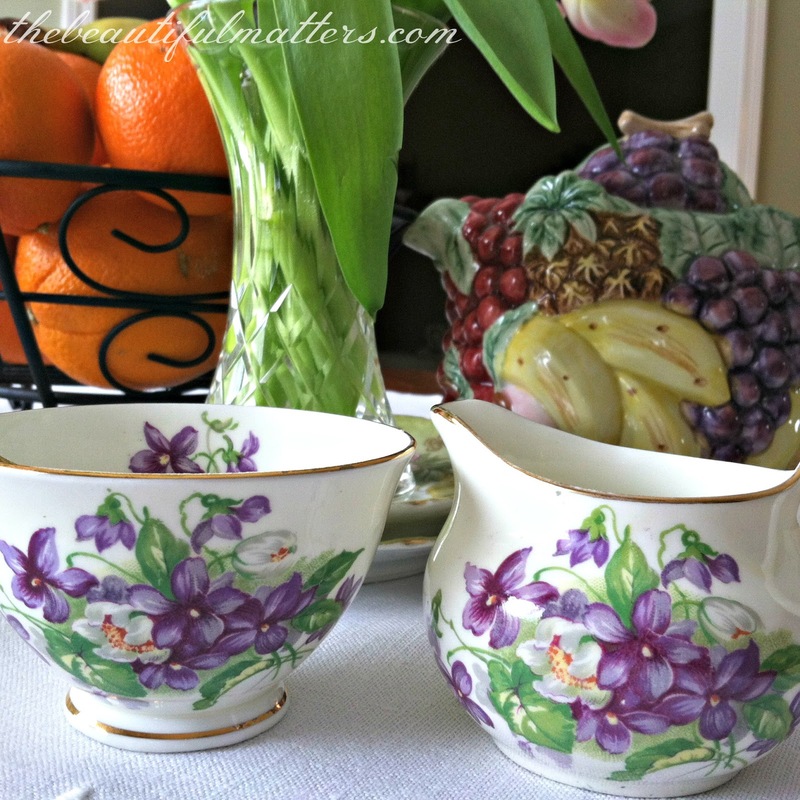 I love violet teacups and china too. So lovely to enjoy your pink tulips. If the snow ever melts perhaps mine will start to peek out of the ground! 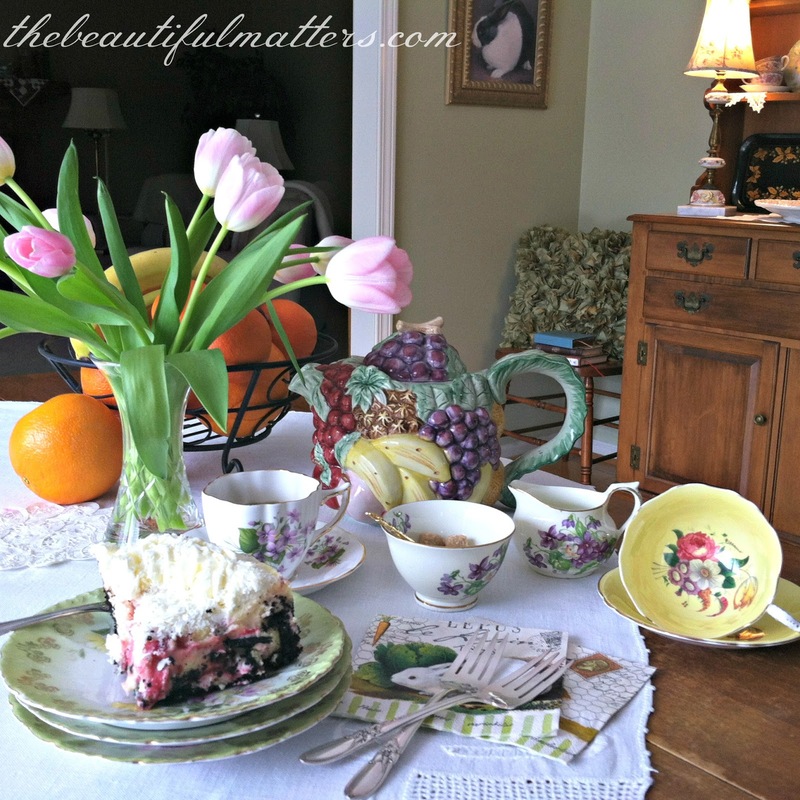 Sweet spring tablescape with your pretty dishes, tulips, and those adorable bunny napkins. By the way I have the Royal Windsor Tea cup and saucier too. Your Spring tea is just beautiful!! I love your grandmother's green plates! Really treasures!! The tulips are perfect for your setting, too. So many beautiful pieces. Just lovely.